What is new in codeBeamer 9.0? Stay lean, avoid redundant work, and reduce development costs in software product line management. Create, compare, and merge development branches. Build multiple product variants without driving up the costs of development. Focus on processes that create value, and stop wasting resources on re-verifying product components. With advanced product line management features (branching, comparing, merging, baselining), this new release helps you unlock efficiencies when developing a product line with multiple product variants. Manage product commonality and variability, and reuse artifacts, product components, and processes to cut the costs of product verification and compliance. Develop the right products for the right market with codeBeamer 9.0’s updated Product Line Management feature set. This feature set is available as an add-on, please visit our pricing page. codeBeamer 9.0’s Audit Trail functionality simplifies compliance audits. Cut product verification time and costs. Let your ALM tool automatically record the lifecycle-wide audit trail, and access or export a comprehensive report with just a few clicks. The all-new Audit Trail feature set enables you to easily draw all lifecycle data from codeBeamer’s central repository. Use the Audit Trail dashboard as a continuously updated wiki widget, or export a comprehensive report with all changes to your trackers, fields, workflows and transition diagrams, and an overview of current permissions. Take enterprise collaboration to a whole new level. Put your chat conversations to work with codeBeamer 9.0’s ChatOps functionality. Access lifecycle data, and execute actions in your ALM or other development tools right from the chat window. Welcome to the era of conversation-driven development with ChatOps. Based on integrations with chat platforms (Slack and Mattermost), codeBeamer’s ChatOps feature brings the power of ALM right to your chat window. ChatOps moves system operations into a group of chat channels, enabling customers and developers to collaborate on requirements and tests, and to deploy software from a single unified command line. ChatOps can increase efficiency, allows more transparent work, and is extremely useful for distributed software development teams. Use bots in your conversations to automate tasks, and manage ALM artifacts with simple chat commands. Attach entire discussions to work items. Add comments, attachments, or trigger state transitions of ALM items without leaving the chat window. Accelerate enterprise teamwork with mobile-ready ChatOps functionality any time, anywhere, on any device. With 50+ integrations, codeBeamer ALM 9.0 fits snugly into your existing toolset without disrupting your processes. Manage any tool or process using codeBeamer ALM as the central platform. In addition to supporting conversation-driven development, ChatOps also connects codeBeamer ALM with the 100+ software tools integrated with Slack. You can use Slack channels to communicate with hundreds of other systems (including Github, Google Drive, Jira Cloud, Zendesk, Jenkins CI, and dozens more). Use Slack to integrate with AI systems, PLM, PDM and other systems without having to do any programming. 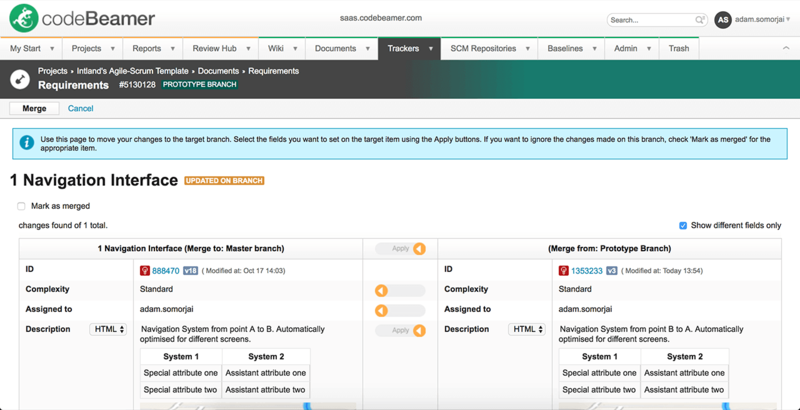 codeBeamer has always been an open ALM tool, offering out-of-the-box connections to popular development & testing tools (IBM® Rational® DOORS®, MS Office, Enterprise Architect, JIRA, Jenkins, HP-QC, VectorCAST, Cantata, etc). This latest release brings an enhanced bi-directional synchronisation with JIRA. For DevOps teams, the release offers new integrations with Docker and Kubernetes. The Tasktop Integration Hub further extends the list of integrations offered by codeBeamer ALM 9.0. Using a tool that codeBeamer doesn’t support out of the box? Tasktop is a cost-effective solution to automate connections with over 50 tools (including IBM RTC, CA Agile Central, Jama, VersionOne, Polarion, HPE ALM, etc). Maintain relations when reusing requirements and test cases. Drive down development costs with mature artifact reuse practices. Save time and effort on product Quality Assurance. The updated reuse functionality in codeBeamer ALM 9.0 lets you reuse groups of requirements with the test cases that verify them. The smart reuse feature works via simple drag-and-drop. Being linked together, you can always be sure that your reused specifications will be covered by test cases. Advanced filtering options in codeBeamer 9.0 help you access the data you need, right when & where you need it. Stay focused on productive work. Use smart logic to refine your searches. Personalized views with granular filtering options let you access any and all lifecycle information with a few clicks. codeBeamer 9.0’s updated views help you search, filter, group, and order all lifecycle data. Create your own filters for certain trackers, save your own views, and share them with other users. Stop scrambling for important information. Access all the data you need at your fingertips with codeBeamer 9.0’s smart filtering functionality. Want to learn more about the updated & new features and abilities that codeBeamer 9.0 offers? Join our webinar: What is new in codeBeamer 9.0? Please note that our JIRA Connector was completely refactored in codeBeamer 9.0. The previous version is no longer supported. The new JIRA Connector may be purchased as an add-on, please visit our pricing page. For more information on purchasing codeBeamer ALM 9.0 and any of our add-ons, please review our updated pricing.